“Right Forward. Left back.” – Is terrific!! Spinning in circles while going down rapids is a great way to spend the morning. Apologies to readers who are more advanced rafters. My first trip was down the family-friendly dammed-controlled Nantahala in North Carolina, bordering the Great Smoky Mountains. 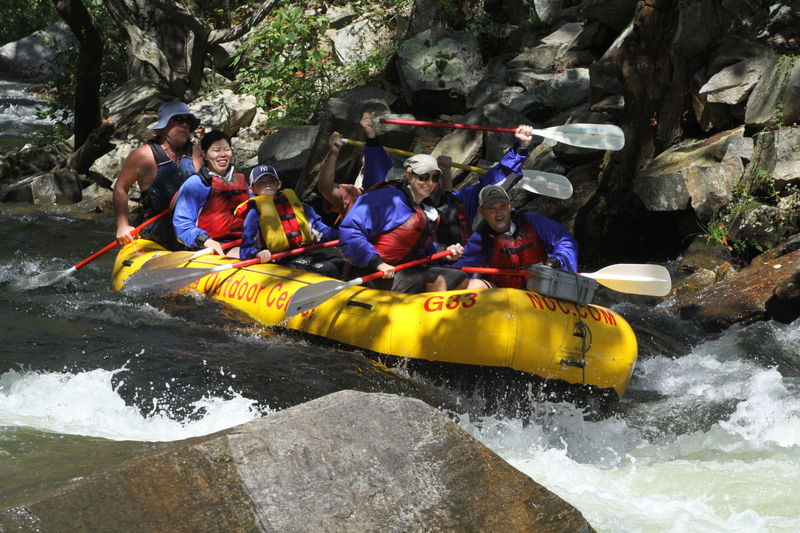 Hubs and I decided that after 17 years of marriage we’d take on some Class I – Class III rapids. As promised, the Nantahala’s “eight miles of bouncy waves and lively current”,made it a white water rafting “delight for all ages”. Yep. We weren’t the youngest or the oldest people in the boat. We chose to sit in the front so we could see. Later, we learned this marked us as candidates most willing to be thrown overboard. Hubs had his turn first at The Whirlpool, one of the most fun spots on the entire river. The river makes a turn to the right and creates a giant “eddy” (another name for a whirlpool- you look that up for a more technical description) from the left bank to the center of the river. The current pushes rafts to the right, but it’s fun to charge left and crash the eddy, which often spins kayaks and rafts. The side tubes of the raft will dip deep into the water. The dipping is what tossed Hubs out. Our raft guide says he’s been throwing people over and swimming there and no one has ever been able to touch the bottom. I’d been teasing our guide, Kyle, that my side of the boat always got wet once my shorts got dry. I got tossed at Surfing Rapid. A much rockier and less glamorous place to be in the water. I handed him the paddle and was pulled back into the boat without knocking myself on every rock imaginable. Honestly, the whole thing was over before it began. The last rapids are the Class III. Hubs saw them coming, let go of his paddle, and grabbed my arm. You can see it in the pic. “I’m good,” I said, wanting to remind him who went over first. And my shorts are dry. Posted in Great Smoky Mountains, rafting, travel, Writing and tagged as anniversary trip, dry pants, saving face, woman writers. Ah, rafting. The great equalizer on the river. So much fun – turns people into laughing children no matter what their age. Oh my goodness. You’re all swollen in the photo. Did you get stung by a bee? 😉 Love that your guide is wearing overalls and a floppy hat. Just another day on the crick. Guidewear – there’s a catalog for that.